Now you all know how I love my neutral eye shadows, I simply cant get enough of them so it's no surprise that I have another palette of sorts to share with you today and this one I have totally fallen in love with... Say hello to the beautiful bareMinerals 'The Truth' Eyeshadow Quad*. 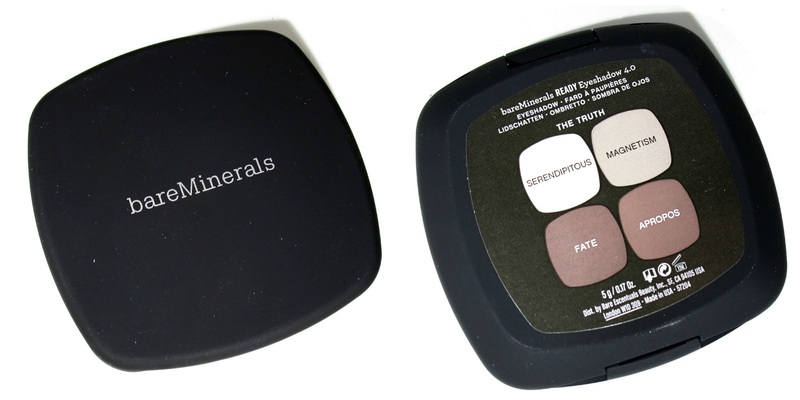 The Truth Eyeshadow Quad is part of bareMinerals 'Ready' eyeshadow collection which are all solid eye shadows that include the SeaNutritive Mineral Complex along with powerful antioxidants, cold-pressed borage oil, caffeine and cucumber-ingredients known to reduce the visible signs of ageing, including a reduced look of puffiness and antioxidant defence for a softer, smoother, revitalised eye area, so it's safe to say the eye shadows in this quad are very kind to the eyes. bareMinerals also say their solid eye shadows in their 'Ready' Quads provide exceptionally vivid, long-wearing colour in an ultra smooth, silky texture for effortless application and seamless blendability, so all in all the little quads sound incredible! The packaging of 'The Truth' Quad is small, sturdy and compact making it great for travelling or popping in your handbag, it has a nice sized mirror within the lid and is made up of that rubberised plastic just like the NARs packaging which I do like but it does get very grubby easily. 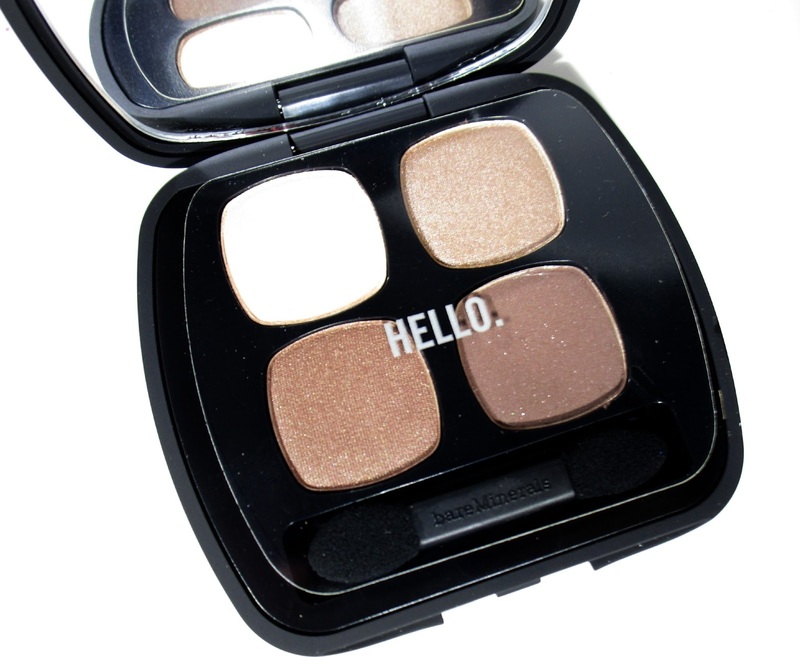 When I first opened up my little quad I was instantly in love as the shades really are stunning and go so well together for natural day looks and for more smokey evening looks too, I love a good bit of versatility! The quality of each eyeshadow within the quad is stunning, they are all buttery soft to the touch and apply/blend out a dream without any fall out at all. The lasting power of each eyeshadow is great and I find they actually last better when I don't wear a primer, I've found that popping a matte nothing kind of eye shadow colour all over my eye lid works well as a nice base for the bareMinerals shadows and I get a full days wear out of them that way, however I did find that the shadows creased slightly when I wore a primer so just bare that in mind. Serendiptous is a soft, warm beige with lots of minute gold glitters running through it and has a soft frost–shimmered finish. I find this shade is best used as a highlight or all over the lid. Magnetism is a gold-bronze shade with a smooth metallic-sheen finish to it, I love using this shade across the entire lid. 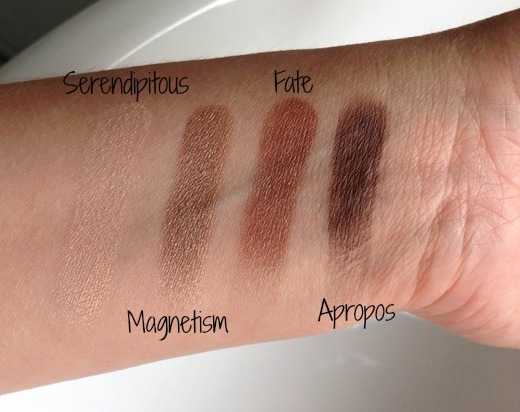 Fate is a warm, bronze-brown shade with a red undertone and finishes with a beautiful satiny sheen, I like using this shade either through the crease or over the entire lid for a more dramatic smokey effect, it works well to define the lower lash line too . Apropos is a taupe-brown shade with flecks of silver shimmer running through it and has a semi-matte finish. I like using this shade more for the evenings as it smokes out and deepens any look and because of the flecks of silver shimmer running through it, it makes it more night time appropriate and gives you that added sparkle without going to overboard. Overall I do love this little quad, the shades are perfect for me and are so wearable for everyday looks and the quality aint half bad either! 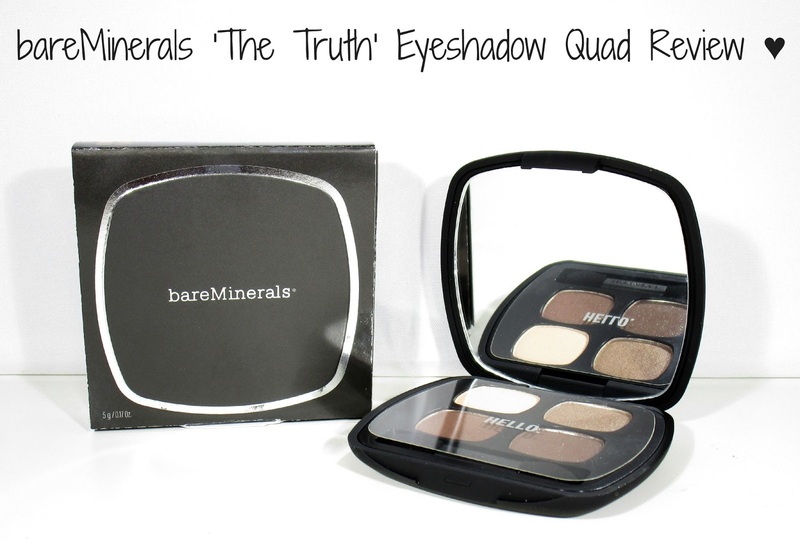 You can find the bareMinerals 'The Truth' Eyeshadow Quad for £22.99 (RRP£29,00) on the Chemist Direct website, its the UK’s largest online health care and pharmacy business, providing quick and affordable delivery of tens of thousands of health and beauty products, whats best is you can save a few pennies on there too he he. 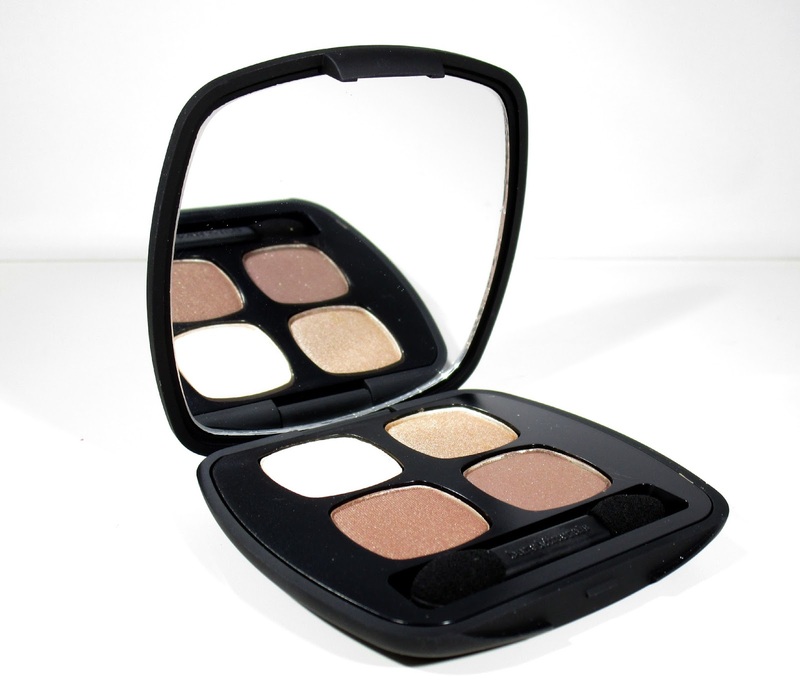 What do you think of the bareMinerals eyeshadow quads beaut's?? I'd love to know. These colours are stunning, exactly the kind of colours I use all the time! Great review! I have a super similar Revlon Pallette that I absolutely adore! This looks really similar but the packaging is super beautiful on this! I love their foundation, its one of my all time favourites so I have been eyeing up this for a while..may have to invest! I have this quad, and it is lovely. Such a good every day palette.